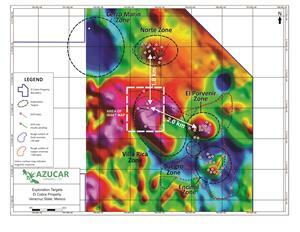 J. Duane Poliquin, Chairman of Azucar commented, “This is a very exciting development in our exploration program. Careful inspection of the drill results at Raya Tembrillo to date allowed us to target a trend in copper and gold resulting in this intercept. We look forward to reporting results from the follow-up drilling underway when they become available”. Several other holes have been drilled in different zones of the large Villa Rica target area and are also reported today. These results are helpful in the Company’s ongoing exploration drill program designed to find as yet undiscovered porphyry intrusive centres. The five copper-gold porphyry targets currently known within the El Cobre Project, Encinal, Suegro, El Porvenir, Norte and Villa Rica are defined by distinct Cu-Au soil anomalies, discrete, positive magnetic features and a large IP chargeability anomaly. The largest target area is the Villa Rica Zone which has only seen limited initial exploration drilling. An overview of the targets’ results to date is provided below and a map is attached. 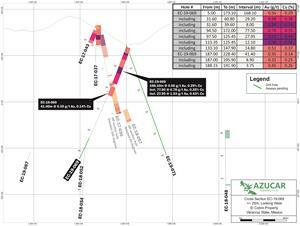 Suegro Zone: Recent 2019 drilling has identified a new porphyry centre between the El Porvenir and Encinal Zones. The Suegro Zone is located approximately 250 metres south of the Porvenir Zone, within a large area of alteration associated with more subdued magnetics, and low zinc and manganese in soil. The Suegro mineralisation intersected in the drilling to date is associated with an altered (locally intense phyllic alteration overprinting potassic) intrusive. Intercepts to date include 28.20 m of 0.54 g/t Au and 0.17% Cu (hole EC-19-064; see press release of March 19, 2019). Encinal Zone: Hole CB5 intersected a highly altered breccia pipe containing fragments of stockwork veining and porphyry mineralisation across which 18.28 metres returned 1.42 g/t Au and 0.10% Cu. The breccia pipe occurs in a large alteration zone, IP chargeability high and ma gnetics low which has not been tested to depth. On June 19, 2017 Azucar announced that a new area of exposed stockwork quartz veining and gold mineralisation had been identified in the Encinal Zone. 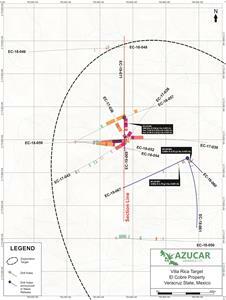 On June 29, 2017 Azucar announced the results of initial drilling on this exposed stockwork (Hole EC-17-025) which returned results including 34.47 metres grading 0.73 g/t Au and 0.20% Cu. Larry Segerstrom, M.Sc. (Geology), P.Geo., A Director of the Company, is a Qualified Person as defined by National Instrument 43-101 ("NI 43-101") and has reviewed and approved the contents of this news release. The porphyry mineralisation reported in this news release is associated with broad areas of alteration and stockwork veining. True widths cannot be determined at this time. The analyses reported were carried out at ALS Chemex Laboratories of North Vancouver using industry standard analytical techniques. For gold, samples are first analysed by fire assay and atomic absorption spectroscopy (“AAS”). Samples that return values greater than 10 g/t gold using this technique are then re-analysed by fire assay but with a gravimetric finish. For copper, samples are first analysed by Inductively Coupled Plasma – Atomic Emission Spectroscopy (“ICP-AES”), with four acid digestion. Samples that return values greater than 10,000 g/t copper using this technique are then re-analysed by HF-HNO3-HCLO4 digestion with HCL leach and ICP-AES finish. Blanks, field duplicates and certified standards were inserted into the sample stream as part of Azucar’s quality assurance and control program which complies with National Instrument 43-101 requirements. A NI 43-101 compliant technical report on the El Cobre project entitled, "Technical Report on the El Cobre Property” was filed in May 2015 and can be obtained from www.sedar.com.